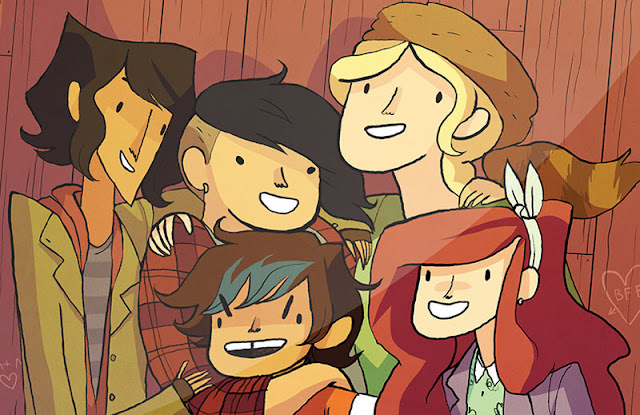 Lumberjanes, the popular and acclaimed all-ages series from BOOM! Studios, will be without one of its co-creators, Noelle Stevenson, "at least for the time being." The busy writer will remain as a consultant on the series about girls at summer camp where some strange supernatural shenanigans take place. Her last issue will be #17 making way for Kat Leyh to join current co-writer, Shannon Watters, beginning with issue #18. Got some bittersweet news for y'all: Lumberjanes #17 is my last issue as a lead writer on Lumberjanes, at least for the time being. Created by Stevenson, Watters, Brooke Allen, and Grace Ellis in 2014, Lumberjanes quickly became a fan favorite and critical darling. A film adaptation is in development at 20th Century Fox. Stevenson is writing 'Runaways' for Marvel and her own comic 'Nimona' is being turned into an animated feature at Fox Animation. With so many projects in the works, it lends to reason that Stevenson would step down from lead writing from Lumberjanes. Luckily, Leyh is a talented newcomer and creator of the webcomic, Supercakes, and should fit right in.